Here are some common questions about Faber® Parts selection and installation. Identifying the type of bridge system on your guitar is essential to knowing what Faber® bridges you can use with your guitar and if your guitar will require conversion studs to use a Faber® bridge. There are only a few guitar models that will not need conversion posts: Gibson® guitars with ABR-1 bridges, and imported guitars with 4mm bridge studs mounted directly into the wood. 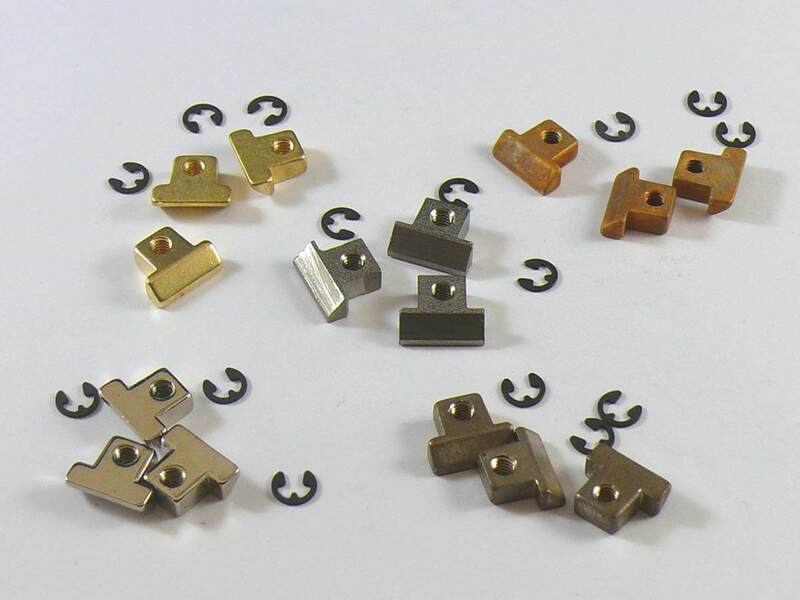 Gibson® guitars with Nashville bridges, Heritage® guitars with Schaller bridges, and Epiphone®, Tokai, Ibanez and other imported guitars that use bridge posts which screw into bushings in the guitar body require conversion bridge studs to use Faber® bridges. Furthermore, many other U.S.A. made guitar brands use imported parts. If the guitar uses threaded bushings for the bridge posts, it will require conversion posts. Some use Schaller parts and others use the same type asian parts used on Epiphone® and most other imports. We invite you see our “Bridge Identification” page, which has photos and descriptions which will help you identify your bridge, and links to the proper category of all bridges and other parts that will work for your guitar. which screws into a threaded metal insert in the body. The combo bridge post/thumbwheel is threaded on the bottom only, and the bridge height adjustment is determined by how far the post/thumbwheel is screwed into the insert. There are no threads above the thumbwheel. bridges, just seeing the bridge is all that is necessary. All Faber® bridges have “Pre-Notched” saddles with small starter notches as standard. We will replace the standard saddles with Non Pre-Notched saddles if this option is chosen. Which direction should the saddle screw heads face? The saddle screw heads on Faber® bridges are set up to face the pickups, just like the Gibson® ABR-1 and many other bridges. 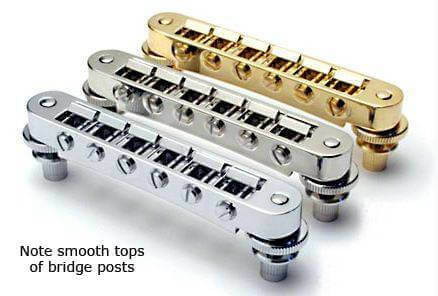 If you are converting from a Nashville or Schaller bridge, you will notice that their screw heads face the tailpiece. 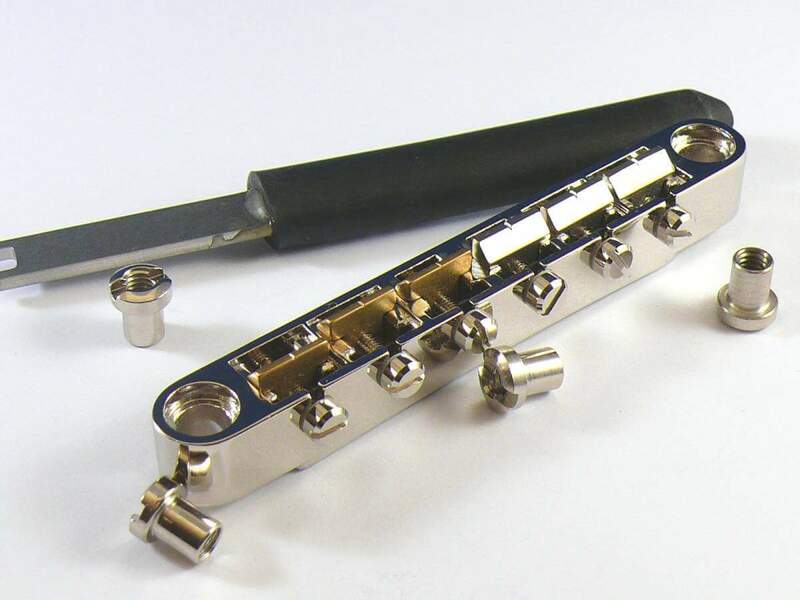 Please be sure to install your Faber® bridge opposite the Nashville/Schaller, with the screw heads facing the pickups. The saddle orientation on the Faber® bridge is set to give proper intonation with the screw heads facing the pickups. Do not be concerned! You can easily turn the screws to set your intonation even though the screws seem close to the pickup mounting ring. How do I remove/replace the saddles on my Faber® bridge? Still need help? Send us a note, or call!